A. Once you find that perfect clock, simply click "Add to Cart" beneath the listed prices. You may continue shopping. Click on [checkout] when you are ready. Please fill out your name as it appears on your credit card and the billing address from your credit card statement. Don&apos;t forget to enter your current e-mail address. By creating an account, you can track the status of your order and next time you shop, you can log in to avoid rekeying your information.Then, enter in your credit card number (without dashes, hyphens or spaces), plus the 3 or 4 digit security code, expiration date, payment method and whether its Visa, MasterCard, American Express or Discover. If you would like the product shipped to a different address, please fill out the shipping address on the same page as your billing address. For a copy of your order, you may print your order prior to paying. If you prefer to order via fax, this form can be faxed to us at 1-920-206-8272. For your protection, we verify with your credit card company that cardholder name and billing address match. Q. What payment methods does Clocks247.com accept? A. Clocks247.com accepts VISA, MasterCard, Discover and American Express. Your card will be debited when we expect to meet our normal shipping time frame of 2 to 4 weeks from the date of your order. You will be given the option via e-mail to cancel your order or to wait for any item that may be temporarily out of stock or backordered. Backorders will be debited to your credit card at the time the item is shipped. Q. Are my credit card and other account information secure? A. Yes. Clocks247.com&apos;s secure software encrypts all your personal information including credit card number, name, address and phone number. Our software utilizes aSecure Socket Layer or SSL technology used by most major retailers. Clocks247.com will never sell or lease your personal customer information for any reason. Q. Why do I need to register my customer profile? A. Clocks247.com collects certain customer information such as your name, address, phone number, email address, etc. to help us serve you better. This helps us to recognize you on future visits to Clocks247.com and will minimize the amount of re-keying of information you have to do. Clocks247.com guarantees absolute privacy with any information given. We will never sell or lease your personal information. Q. How do Clocks247.com prices compare to other internet retailers? A. At 20-50% off manufacturer list prices, you will not find a lower price than at Clocks247.com. We monitor our competitor&apos;s websites and adjust our prices accordingly. If you do find a lower price online, please e-mail us at sales@Clocks247.com or call us toll-free at 855-242-0514 with the lower price and the name of the website. Once verified, we are glad to match the competitor&apos;s price and shipping. We are an authorized dealer of great American brand names. NOTE:This LOW PRICE GUARANTEE does not apply to clearance, auction, re-furbished, or factory second merchandise. We only sell first quality merchandise at incredible values. Q. 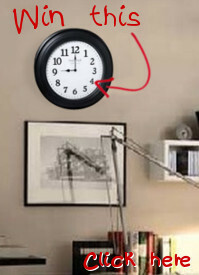 Does Clocks247.com collect sales tax? A. Only for Wisconsin residents. Clocks247.com does not apply sales taxes to purchases made by non-Wisconsin residents. Q. Can I place an order without using the internet? A. Yes. You can either print out your order and fax/mail your order to us along with mailing your check or money order (made payable to our parent company Home Concept). Also you can call us toll-free at 855-242-0514 to place your order. Please have your credit card and item&apos;s style # available prior to calling. Q. How does Clocks247.com deliver my items to me? A. Most items are shipped via FedEx or UPS. Instock items ship from our warehouse located in Madison, WI. Out of stock items will ship directly from the manufacturer. We process your order within 24 hours. Please allow up to 4 weeks for delivery. Most items will ship within 2 weeks. (If specific items take longer, it will be noted on that item&apos;s information page.) As always, we will notify you via e-mail if the normaldelivery time cannot be met. A. We will charge you the actual shipping charge, based on UPS or FedEx ground. Expidited shipping is available at a higher charge. Grandfather clocks and other oversized items cost $90 to ship anywhere in the lower 48 states. Q. Does Clocks247.com ship outside the continental 48 states? A. Yes. We can ship to Alaska, & Hawaii, but at a higher shipping cost. Currently, we are unable to ship outside the United States. Q. What if I receive damaged merchandise? A. Any damage due to freight handling or factory defect will be repaired or replaced at no additional charge to you. Please e-mail us at sales@Clocks247.com within 7 days of receipt of your damaged product with the following information: billing name on order and your order number. Q. What is Clocks247.com&apos;s Return Policy? A. Returns are allowed within 14 days of delivery. Simply e-mail us your order number and the name on the order torequest a return authorizationnumber and return instructions. Any items returned without a return authorization will be assessed a 20% restock and special handling fee. (Grandfather Clocks are non-refundable.) Upon receipt of the merchandise in original condition, we will refund you the total less the original shipping and handling. All returned items are shipped at the customer&apos;s expense. If shipping via US Postal Service, insurance and delivery confirmation is also required for your protection. A. Clocks247.com will honor all available manufacturer warranties still in effect that covers manufacturer defects. Q. Do you offer discounts for volume orders? A. Depends on the manufacturer. Some purchases may qualify for special pricing and/or shipping. We will gladly pass those savings, if available, from the manufacturer to you. Please call us toll-free at 855-242-0514 to place your order. Then, we will call you back with available savings. Q. Do you guarantee prices for any period of time? A. We strive to provide great products at low prices. The only time our prices change is to reflect changes in pricing from the manufacturers. Also, we pass any savings on to you if a manufacturer reduces the cost of an item. It is our goal for our prices to be 100% accurate, however we reserve the right to correct pricing errors. Clocks247.com has agreements not to sell below the minimum prices established by certain manufacturers and we are bound to honor those agreements. Q. Can Clocks247.com send me a catalog of all your products? A. Our website is our entire catalog available 24 hours a day and 7 days a week. Please feel free to print images and product information from our website for your personal use. Q. What manufacturers do you currently carry? A. Clock Brands: Bulova, Seiko, Howard Miller, LaCrosse Technology, TimeWorks, TimeKeeper and River City. For free shipping, simply fill your cart with at least $99 worth of wonderful clocks and you'll instantly qualify for free ground shipping to anywhere in the LOWER 48 United States. Your order will ship via FedEx Ground, UPS Ground, or USPS. Ordering less than $99? Then our shipping is only a flat rate of $9.00 per item to anywhere in the LOWER 48 United States. You will always get free or low cost shipping at Clocks247! Alaska, Hawaii, Puerto Rico and APO and FPO shipping charges vary based on size and weight. Oversized items may be higher. Please call for more detailed information regarding Alaska, Hawaii, Puerto Rico, APO & FPO shipping. We mainly ship via USPS to these addresses and must charge at the Post Office's rates. These orders do not quality for free shipping. Need it faster? We will do whatever possible to get your item to you fast. But when fast isn't fast enough, please call us toll free, or email us for other options.